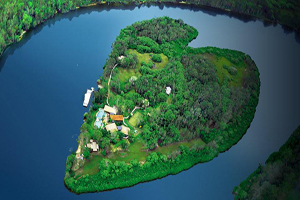 Makepeace Island, a private island retreat owned by Sir Richard Branson, has opened its doors for private lease. Located in Noosa River on Queensland’s Sunshine Coast, the Balinese-style property offers accommodation for groups of up to 22 guests. The resort has spa facilities, a tennis court, theatre and office facilities.